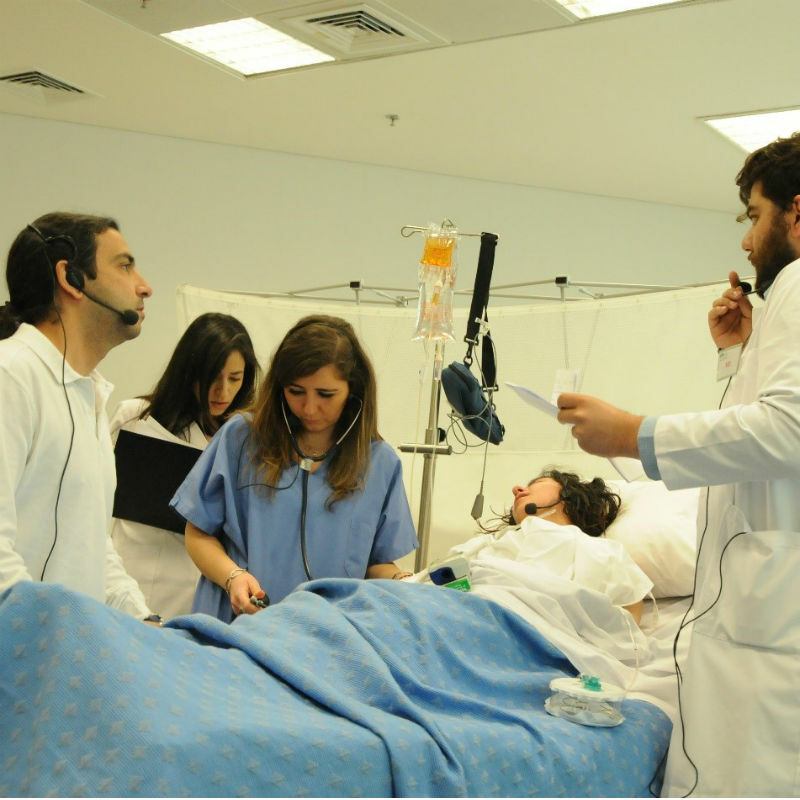 The Clinical Skills and Simulation Center in Byblos hosted the second day of the “Advancing Patient Care through Interprofessional Collaboration” http://ipe.lau.edu.lb/resources/conferences/ipe-2016/ conference on April 16, 2016. This conference was the first of its kind in Lebanon as interprofessional education and collaboration are becoming priorities for safe and effective health care (IOM, 2015 & WHO, 2010). After a series of presentations and moderated discussions on April 15 and the morning of April 16, three collaborative practice workshops were concurrently held and repeated to allow the majority of conference attendees to participate. Two of those workshops included medium- and high-fidelity simulations and debriefings, and the third included role play and case discussions. “Decreasing Complications of Mobility Impairment through Collaborative Practice” was the main theme for the first simulation workshop. 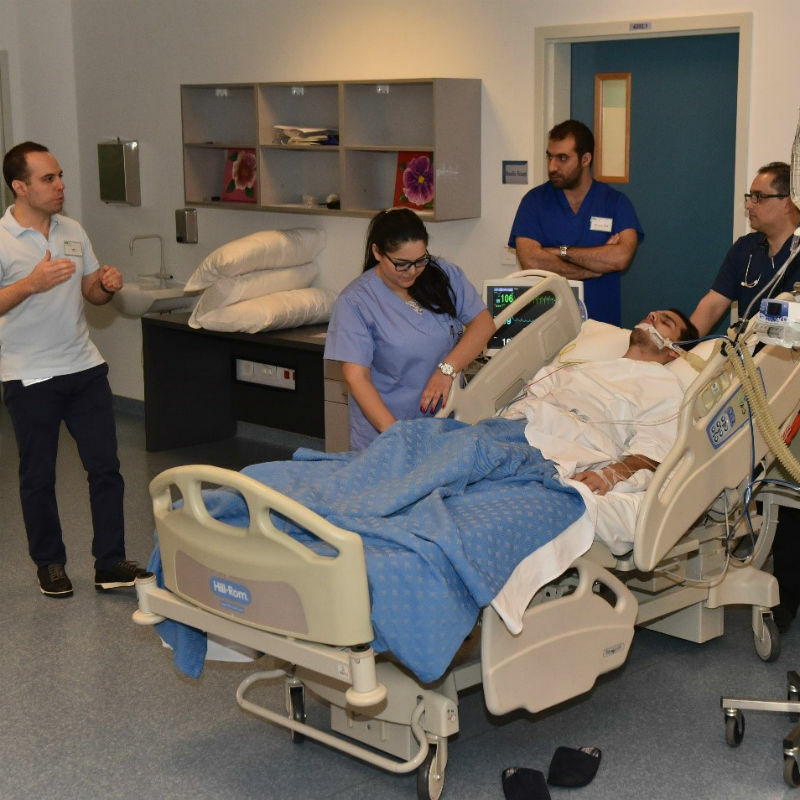 It was developed and delivered by an interprofessional team which included LAU faculty, conference speakers, clinical professionals, and standardized patients (actors) using a simulation approach to learning and practice. The workshop stations were transformed to in-patient hospital rooms in an acute care setting. Interdisciplinary teams worked together to deliver and demonstrate the best practices and latest evidence on safe patient handling, avoiding pulmonary complications in patients with limited mobility, and intervening for safe skin in the acute care of patients with limited mobility. The scenario mimicked reality, and workshop participants experienced team decision-making and collaborative practice first-hand. The second simulation-based workshop revolved around “Pain Management though Collaborative Practice: An Optimal Use of Available Resources”. The session started with a simulation scenario of a patient presenting to the surgical ward with excruciating acute pain status post right-sided mastectomy. The scenario players comprised a standardized patient and a confederate (husband), one nurse, one clinical pharmacist, and one physician. In an effort to promote teamwork, workshop participants were divided in groups involving various health care disciplines, and were provided time to reflect collectively on the simulation scenario using a checklist adapted from the Intreprofessional Collaborator Assessment Rubric (ICAR). A debriefing session followed, where the speakers solicited input from team participants. To further emphasize Interprofessional Collaboration, the speakers’ panel was composed of an anesthesiologist, a clinical pharmacist specialized in oncology and a pain nurse practitioner. The audience deliberated on the scenario’s communication, collaboration, roles and responsibilities of health care team members; collaborative patient-family centered approach; conflict management and resolution; pain management and assessment, and barriers to pain management. The workshop concluded with speaker presentations that addressed acute pain assessment and management, barriers to pain management and the role of interprofessional collaboration in providing effective pain management and improving patient outcomes.